This modern holiday home is situated just right on Müggelsee, the largest lake in Berlin. It has its own luxurious relaxing area. You have recreation amidst nature and adventure in the Metropolis. This modern holiday home is situated just right on Müggelsee, the largest lake in Berlin. It has its own luxurious relaxing area. You have recreation amidst nature and adventure in the Metropolis. In this holiday, Berlin allows you to connect together perfectly!Thanks to the flexible price per day system! Here you get offers for all budgets and holiday types. Whether it is a spontaneous short trip, an extended weekend, a long relaxing summer holiday on sea or a short break during cosy and comfortable winter, you can enjoy a recreational holiday as well as ice skating next door!You can simply be lost in this spacious holiday home, which measures more than 100 square metres. The living area is wonderfully bright because of the very large windows. On the terrace, you can relish delicious barbeque and breakfast or just simply enjoy the sun. Also, a fully furnished, open kitchen welcomes you for cooking.You will discover the highlight of the house on the top floor where you have your personal relaxing area with sauna and Jacuzzi. Is there anything more beautiful than letting your soul relax after an exciting day in Berlin? You can ask for a suitable massage or you can even book a personal trainer, so that you are completely comfortable. You have direct access to the balcony from the wellness room. The house is equipped to the latest standards. For example, it has its own drinking water treatment plant with Reverse-Osmosis Technique. Hence this filtering technique ensures you of pure drinking water. Thanks to the air-conditioner, floor- heating and cooling, that makes the stay in the house pleasant, irrespective of the weather condition and the season. Please note that the satellite images on the map (under "map and place information") are not up-to-date. Still visible on the map, the construction site does not exist anymore. The holiday village is completely ready and a relaxing holiday invites you.The home is located in the holiday village Rübezahl, right on the big Müggelsee, in the middle of a nature-sanctuary. The traditionally rich restaurant, Rubezahl is right next to the holiday home estate. You can not only enjoy the typical Berliner cuisine or find comfort in the beer garden here, but also can find great leisurely offers: you can rent sailing boat, row boat or canoes. During summer, grill boat is also available for rent and in winter you can skate in the adjacent ice rink. The kids can run around in the large adventure playground to their hearts’ content. In restaurants, breakfast as well as delivery service are also available if booked in advance. From the holiday village, you can reach Berlin-Köpenick by bus or car in just a few minutes. You can easily and quickly reach the centre of Berlin by S-Bahn, usually, without switching the trains. For example, the S-bahn takes only 20 minutes to reach the famous Alexanderplatz. Alternatively, you can reach Berlin centre leisurely by waterway, since various boat trips are offered on site. 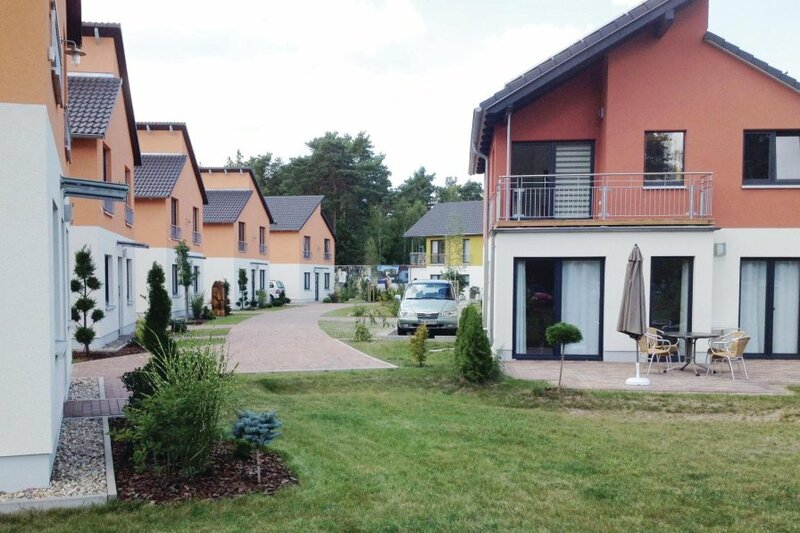 The use of air conditioning incurs higher power costs EUR 50 towards the remote control of the air conditioner should be deposited.Other houses in this holiday village: DBE401 - DBE422.Some of the photos can be samples of identical houses. The actual colour of the furnishings and the house may vary. Please note: construction work nearby from 30/08/2017 until 31/12/2019. This beautiful modern house is made from brick or stone and was recently built in 2012. The agent has rated it as a five star property so it is one of their best houses - tastefully furnished and fully equipped. It is also great value for money. The houseIt is located in Koepenick, 20km from Berlin. The nearest airport is only 25km away. It is set in a very convenient location, just 80 metres away from a lake. There's also a restaurant only 100 metres away. The house has wireless internet available for an extra charge. You can also park on-site at no extra charge. The house is well equipped: it has a refrigerator, shared washing machine and dishwasher. The property has a sauna; it also has a barbecue and some garden furniture outside.